28,765,000 AP earned. Almost 3.5 million in a month. If that pace continues, well, yes, I will end up at L16. 3,000 unique hacks. 1,500 unique captures. 8,235 links, once again, over 1k in a month. 5,214 fields. Over 500 in a month. 1,703,000 MU scored. That’s 127,000, although, most of that was in a single day. 37,600 Builder and 28,200 Purifier. 5,500 Liberator. Made gold, need 15,000 for platinum. Closest badge to completion is Purifier, only need to kill 1,800 enemy resonators for gold. The one I’m most interested in is the one I’ll probably never complete, Onyx Illuminator – only 4,000,000 MU total need to be scored. Now with 24 unlocked heroes, Blue Prestige Captain America, and 3500 or so Omega points. Just a matter of grinding it all out. Spiderman and Colossus should be at level 60 soon. On the mobile : The moon is complete ! Still working the Earth. And the desktop has quite a ways to go. The mobile gets so many more advantages versus the desktop it’s not even funny. There were some important changes yesterday to the silly-and-completely-addicting money game “Adventure Capitalist”. #1 – When you have the app open, you’re getting a x5 multiplier. If you’re really determined, you can leave the game open for a long time and get a fair amount of extra money. I don’t think I’m that determined but it’s nice to see. #2 – After you make each of your investments on a planet (Permanently) platinum, you can also add this multiplier for the megabucks. 77.77 x is a pretty nice jump. Next level is 777.77x. And then, at 5 am this morning, it happened. I got over the long mountain climb to reach 2,880 oxygen bars and suddenly things are advancing very quickly. Of course, part of it was this 77.77 multiplier being added but it was nice to see it finally happen. I have about 50 more unlocks on the Moon, and a ton of them on the Earth. Now, however, the Earth is completable depending upon how fast you can accumulate megabucks, the in-game premium currency. My next reset, to be processed after blogging, will involve 10,000x the number of angels previously held. It could be the Moon will be finished post haste if that trend continues, similar to the Mars planet. And then it’s just a matter of finishing up the Earth, and laughing all the way to the bank. Holding 5 Novemtrigintillion dollars at the moment – go ahead, try and relate that to a real life number, you can’t. Ah, the thought of having that much money…..
With a mammoth case of writers block, I figured I’d toss out where the stats have me in various games I’m playing. The next real hurdle is getting to 2,880 Oxygen Bars. Quite a ways to go, considering costs – I have 2,654 in my current mobile game, and 2,671 on the PC. 5,914 of 25,000 links for platinum. 3,771 fields of 10,000 for platinum. 45,659 of 50,000 glyphing points. 4,782 of 5,000 for gold Engineer. Getting close. I’m taking a different approach to the game now. Instead of trying to help cover Southern California, I’m more hyperlocal in a few select areas. If you quit worrying about big operations, that changes the game a lot, as well as taking the pressure off of playing all the time. Downtown Burbank is of course the main focus. And wherever I travel, I keep Ingress in mind. Pt Mugu has a neat little campground I was not aware of, and it also contains four portals in various spots – one being behind an “Hours of Operation” barrier. The Malibu guys seem to want to link to it to keep a block up, so I’m holding the keys I own and charging that portal. Sometimes, it’s the little things. Not feeling a lot of interest. Get in, play for a little bit, and log off. I’m moving Black Panther along and he’s almost 50; he’ll make my 18th Level 60. Still collecting items for Level 69 unique crafting. It’s fun playing in Hightown with the guaranteed unique from every boss wave, this is helping me move forward with the “Completion” of relic stacks. Once I have 1,000 of some of them, I can start giving them to the unfortunate later heroes who don’t get any yet. Finish one nation – buy all the tanks. In a sense I’ve finished one line given that I have the Maus; the German TD line ending in JPE 100 still contains one TD I never bought and thus isn’t “Finished”. Sitting on 5 million credits waiting for something to happen worth spending on, and currently saving above that mark for the Tier X STI gun. I’ve been playing two low tiers in the hope of Aceing them. Skills keep going up, so it’s hopefully a matter of time and good luck. And I’ve got four TD’s I’m grinding up as well. And gaming, as always, continues – even if I can’t write much about it. Resource looked like an interesting game. An economic focused augmented-reality/location based game. So I installed it, loaded it up, and played with it a bit. Until I realized I was going to be driving someplace to start up clay pits, which is very close to Ingress play anyway, and I uninstalled the game immediately. Running an errand, Ingress style. But if I find myself near a portal, I’m hitting it. And I got bored at lunchtime today and took an Ingress walk, which was a lot of fun. AdVenture Capitalist remains a fascinating diversion. Teaching a sense of scale via numbers is the best thing about it. Don’t worry about your millions when you are counting in decillions. The tricky part being game balance. All milestones have been achieved. I achieved them in a few days time, due to an imbalance in the way angel investors are earned. So, nothing further to do here. According to the guys on the internet, Earth is not solvable. The only way to unlock everything similar to Mars, is for thousands of years to pass in real life. I’m continuing to advance it anyway since it’s fun. Getting 5,000 newspapers would be quite an achievement. And if nothing else, they’ll probably rebalance this at some point. I previously finished off the Earth……… and promptly quit playing. Dollars to donuts, a lot of people did the same, so the developers made sure you couldn’t just finish. The moon is a special case. Here, the balance is tweaked such that certain investments are much more valuable than others. How is that ? It’s all about Oxygen bars. Getting 2,880 of them gives you a multiplier on them of 666666. Even with the previous unlock (55,555) buying one oxygen bar is more valuable than hundreds of moon shoes. So eventually I figured out a few things about playing the moon. First – Moon shoes and gravity booths are pretty useless. Buy moon shoes only up to 2,560. Unless you somehow have enough money for 5,120, which gives an unlock of 999999999. Not happening to me anytime soon. Gravity booths should only be purchased to the degree they “don’t matter”, because the money is better spent on oxygen bars. Cheese mines would be very useful but they follow a pattern similar to the moon shoes – just buy 1,024 of them. The other investments are useful to buy for fun, and can provide small incremental income amounts – especially when they are low cost. Can you buy 200 helium farms for a x7 unlock ? Well, sure. But don’t buy them until you hit that point. Keep buying oxygen bars. The game linked above gives 21 untrigintillion income per second after buying a single oxygen bar. Buying 150 helium farms gives the amazing return of 700 trigintillion and costs more. So I’m only buying to get myself big multipliers, or oxygen bars. The strategy is to increase your angels by 50% with each reset, to hasten the time when you achieve 2,880 oxygen bars, and then the game should be finishable in a short period of time. Notice how these are mobile games ? Yep, I’m pretty much on mobile right now. I’m also playing the Vikings game from Plarium, which is easy simple timer stuff and not something I’m sure I’m enjoying. Really, the best thing is AdCap. And the quietness continues. Sometimes, you just don’t have a lot to blog about because Real Life. Kids take priority. So does taking care of your wife. Your job. Et cetera. Still gaming, but not as much to write home about. I now have an Adventure Capitalist account installed on my mobile as well as the PC. On both, the goal is still the same – finish all the unlocks and find out what happens after you have 999 Novemnonagintillion dollars. The mobile gives you a +5% bonus just for being logged into the Kongregate website, so they can track me and sell whatever information they can glean from my phone. I guess it’s a good bargain. I now have Daredevil at level 52, and am waiting for something to finish….. 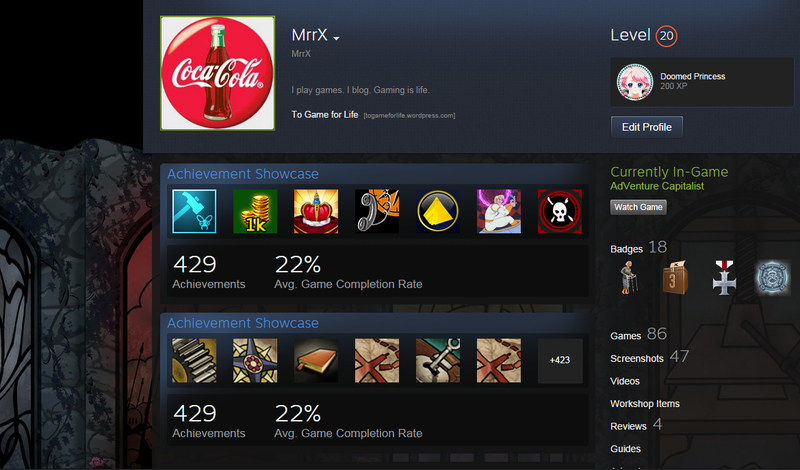 There are a metric ton of achievements suddenly built into the Steam client. The update happened during the day Friday morning so I am only able to start the update Friday night. I bet the servers are slammed. I should also end up with some serious achievement spam once I can successfully log in. And finally, Ingressing at the moment is a matter of charging the guardian only. 180 plus days in.